Grading Washington silver quarters is a skill that has taken even the top coin collectors many years of experience to perfect. Remember that coin grading is the expression of an opinion that describes the condition of an individual coin that a majority of dealers and collectors would agree with. Grading is not an exact science where a procedure can be applied and everyone comes out with the same grade. But over the years, numismatists and coin grading services have agreed upon certain definitions, descriptions, and Sheldon's numeric values that help all coin collectors describe their coins accurately (for the most part). This guide will help you understand those terms and descriptions so you can accurately grade your Washington silver quarters. Washington silver quarters are made out of 90% silver which is relatively soft and malleable. Grades of mint state or uncirculated are determined by examining the high points of the coin's design. The photo on the left illustrates the design highest points on the coin (indicated by the color red). 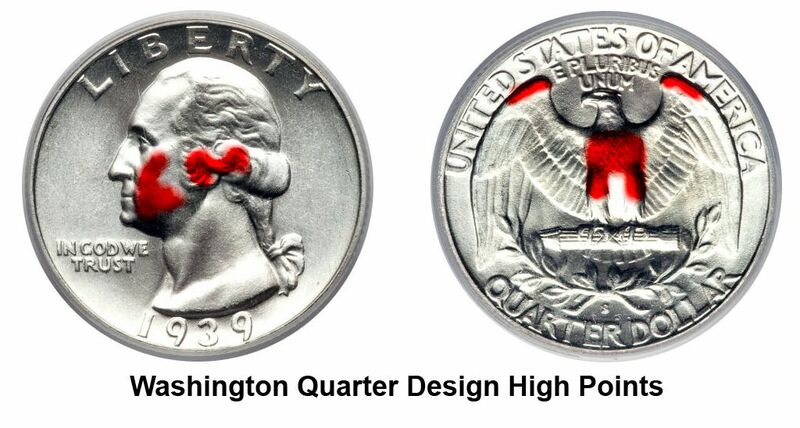 If you think you have an uncirculated Washington silver quarter, look at these areas on the coin first to see if you can spot any wear. If there is wear, then it is not uncirculated. The coin is very heavily worn and barely legible. Some of the devices, lettering, legends, and date may be worn smooth, but the date is readable. Portions of the rim blend into the lettering. Obverse: Parts of the word "LIBERTY" and the date are merging with the rim. All details on Washington's head are worn away and just an outline remains. Reverse: The lettering next to the rim is almost worn smooth but somewhat discernible. The eagle's head and torso are completely smooth and just an outline. The coin is heavily worn overall. The devices, lettering, legends, and date are readable but may have some faintness in a few areas. All major features are visible in at least outline form and the rim is mostly complete but may be incomplete in a few spots. Obverse: Washington's head is well-worn and very few details remain. The letters in "LIBERTY" and the numerals in the date are starting to merge with the rim but are full and complete. Reverse: The eagle is worn almost flat but a definitive outline exists. The letters next to the rim are worn to the point where they are beginning to merge with the rim but are complete. Reverse: About half of the wing feathers are now clear and distinct. The breast and legs of the Eagle are only an outline. The leaves on the wreath show very little details and the rim is nearly complete. Obverse: Details are beginning to show on the hair on the back of Washington's head. The rim is crisp and clear and totally separated from the letters. Reverse: Major details on the eagle's breast and legs are starting to show but the finer details on the feathers are worn off. About three- quarters of the feathers in the wings are now showing. The rim is full and complete and separated from the letters. Reverse: The eagle's breast is apparently worn but a few details in the feathers are starting to show. The legs are worn smooth and most details in the eagle's wings are evident. Reverse: There is light wear on the high points of the eagle's breast. Most feathers on the breast are now visible. Finer details in the eagle's wings are clearly evident. Wear is evident on only the highest points of the eagle's legs. Reverse: Only a slight trace of wear is visible on the highest points of the eagle's breast feathers and legs. All finer details in the eagle's wings are clearly visible. Reverse: There is no trace of wear on the eagle's high points including the breast and the upper tips of the eagle's wings. There are a significant number of distracting marks on the eagle. Reverse: No wear is evident anywhere on the coin. Only a few minuscule marks may be seen on the Eagle. Reverse: All details of the coin are clearly visible even on the highest points of the coin. The eye appeal is superb. Pay special attention to the eagle's breast and legs.